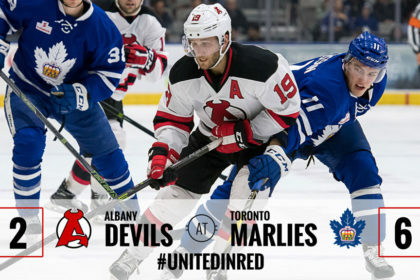 TORONTO – The Albany Devils fell to the Toronto Marlies, 6-2, during a Sunday matinee at Ricoh Coliseum. 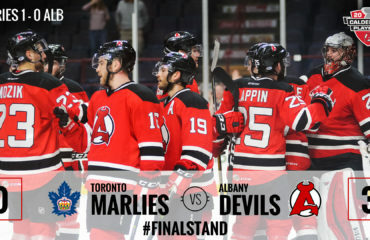 The Devils record moves to 28-21-1-1. 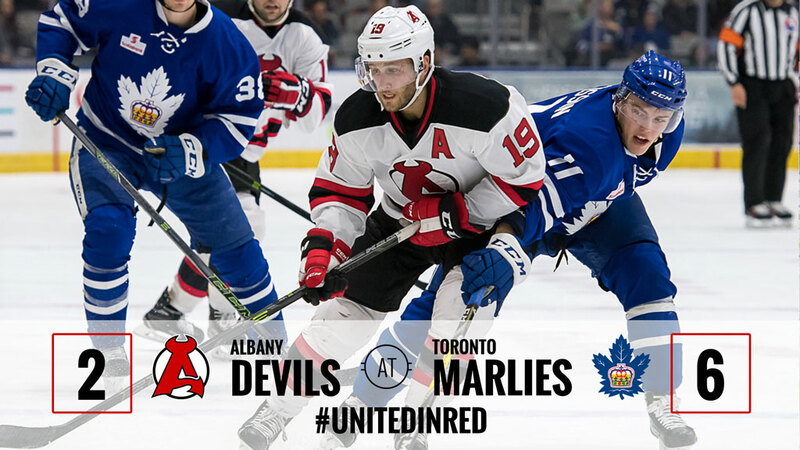 The Marlies record improves to 24-21-3-1. Toronto’s Travis Dermott got the Marlies on the board first with a power play goal at 3:08 of the first period. Justin Holl made the score 2-0 at 1:02 of the second period by tapping in a Kerby Rychel pass at the near side post to beat Devils goalie Ken Appleby. The Devils responded just 18 seconds later after Carter Camper got a rebound and slipped it past Toronto netminder Garrett Sparks. Josh Jacobs and Nick Lappin picked up the two assists on the play. Byron Froese netted a shorthanded goal at 14:25 of the second period, on a breakaway into the zone. Just 30 seconds later, Reece Scarlett scored a power play goal from the far side circle, making the score 3-2. Jacob MacDonald and Blake Coleman earned the assists on the play. 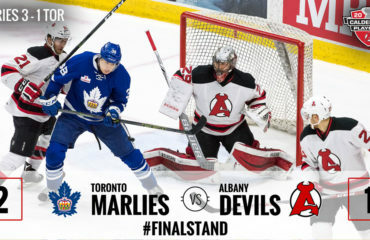 Frank Corrado, Justin Holl and Andreas Johnsson netted the final three tallies for the Marlies at 12:50, 14:51 and 16:04, respectively, of the third period. Appleby faced 31 shots, stopping 25 of them. His record moves to 14-10-0-0. Sparks stopped 31 of 33 shots and improves his record to 13-6-0-3. 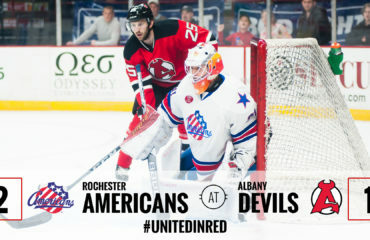 The Devils host the Syracuse Crunch Wednesday for a 7 pm puck drop at Times Union Center.